I didn't stitch much yesterday. I spent a lot of the day organizing my stash, which is almost as much fun as stitching. 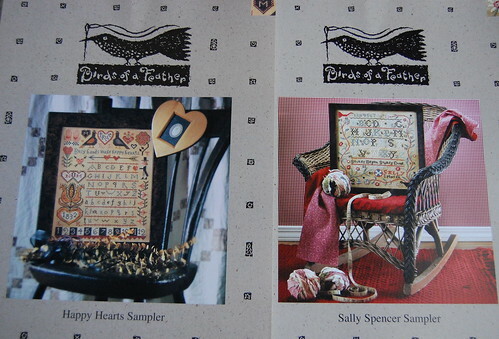 I'm thinking of planning on stitching mainly samplers in 2009. I would love to have a sampler wall. I would love one like Diane Jourdan's of Sampler Cove or like Merumo's. They are both gorgeous! 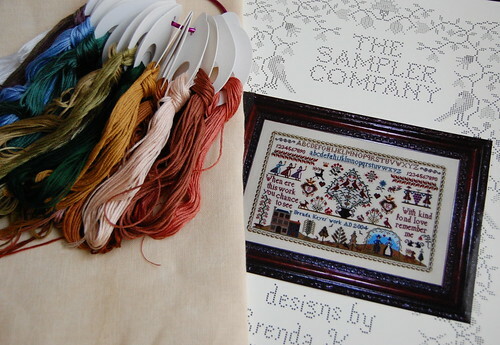 I have decided one sampler that I would definitely like to stitch next year is "Kind Fond Love Sampler" by The Sampler Company. I decided to kit it up yesterday. My only dilemma was fabric. I didn't have any 40 ct. long enough. So I decided to cut up the fabric I had for "And They Sinned," which is 40 ct. 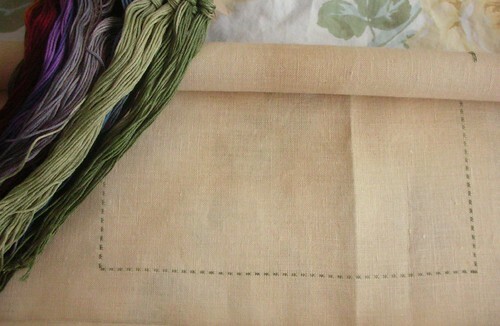 Elegant Bean (coffee-dyed linen by Elegant Stitch). I came to the conclusion that I'm not going to stitch it anytime soon. I think I may have to wait until the kids are in college for that one. While I was getting the threads together I noticed I was getting low on Thread Drops. I thought for sure I had another package, but I couldn't find them anywhere! 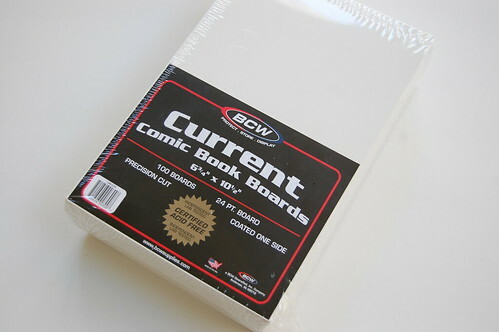 I had bought some Comic Book Boards on ebay not too long ago. I learned about using comic book board through Jane Timmers. She had us use this board for our needlebook in her class. I thought the board would also make great thread drops and it does! BOAF "Happy Hearts Sampler" and "Sally Spencer Sampler"
BOAF "Red Reindeer" and "Winter Sampler"
I kitted up "Red Reindeer" and "Winter Sampler" too. I hand-dyed some of the Elegant Bean last night using some tan Rit Dye. I think I may dye some more - I really like how it turned out. great starts and kitting up! Are you going to stitch Peppermint Twist by Blue Ribbon Designs? if so, let me know. Michele and I are going to do a SAL starting in January. Really wonderful stash! and great wips! Hi Nicole. I'm home today due to not feeling well but it's nice to be able to spend more time reading blogs! You've got lots of wonderful projects there, as usual! Thank you so much for your compliments. We do have similar tastes as I just went and ordered Christmas Tea! 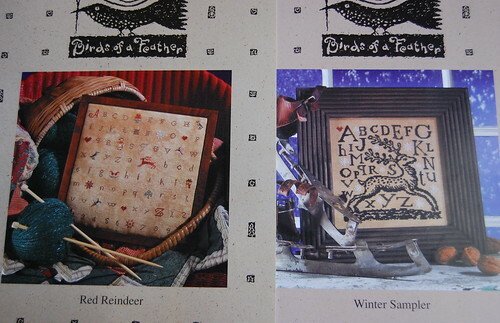 BTW, next year I'd like to stitch BOAF's A very Fine Sampler. I'll let you know maybe we can organize a SAL. Happy Stitching! You will be busy next year for sure! I hope you don't give up on those LHN/CCN charts! I've had red reindeer for a couple of years now and I really need to get it stitched up! Whoa - that's some beautiful patterns and planning you've got going on! I'm looking forward to seeing them in progress! Love your pictures, as always! Wow! I sure enjoyed reading your blog with much interest! 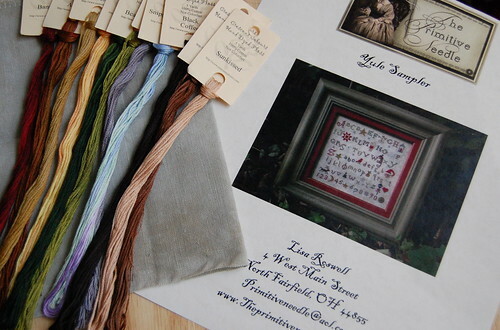 You have some great projects lined up and I think focusing on samplers for 2009 is wonderful! I've made thread drops, too, ...very fun to make. Love seeing your projects all kitted up. They look great and want me to go and do that. I do have a lot kitted up but the thread drops look nice. What an interesting post to read, Nicole. Love all your stash and I'm quite partial to BOAF charts too. :) You're going great with your fabric dying. 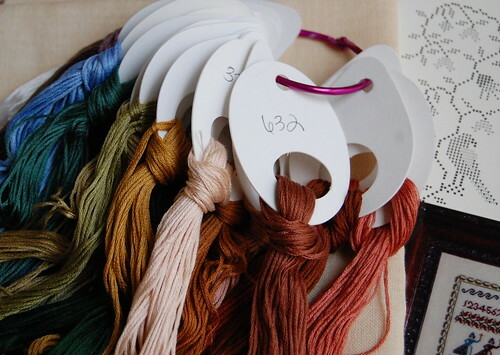 Those creative juices are flowing with the thread drops you've made too. They look awesome. I've got Kind Fond Love in my stash and it looks such an interesting piece. Hope you enjoy stitching it. I love playing with my stash almost as much as I love stitching :-). 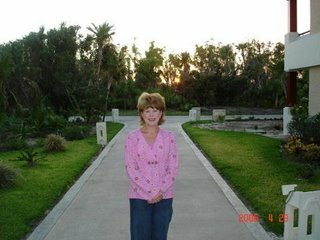 I really enjoyed looking at your pictures and reading your post. The BOAF charts are all very pretty. Great stash--I'm in love with the BOAF designs. Not surprisingly, I also adore Primitive Needle. I don't have as many of either as I would like! Hi Nicole! I read your blog regularly, but usually just lurk. 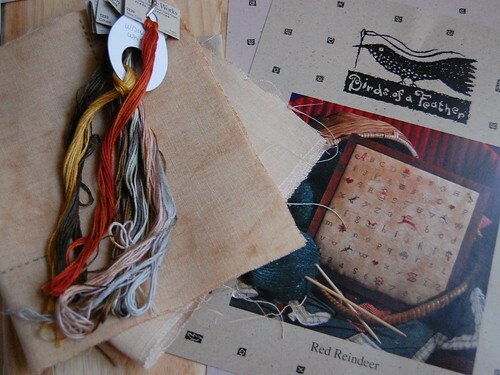 I just picked up "Yule Sampler" as well, at the Shepherd's Bush shop in Utah. They had a color and fabric conversion. I loved it. And, after seeing your floss on the fabric called for, I love that too! Hmmm, what to do? Maybe I'll have to stitch it twice. Great charts and plans. Thanks, too, for the links to the other blogs; I've not seen any of them!